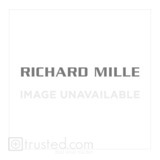 Richard Mille RM 028 AUTOMATIC DIVER'S WATCH 528.45M.91K-1: This watch features automatic winding movement with hours, minutes, central seconds, date and adjustable rotor geometry. The double barrel system helps to improve the stability of torque over a longer period. This is achieved by using more turns, thereby reducing pressure and friction on the teeth, the bearings and the pivots, resulting in improved long-term performance. 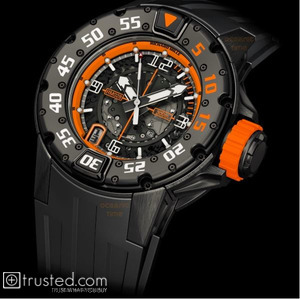 The watch is water resistant to 30 atmospheres (300 meters) following ISO 6425 diver’s watch norms. This is achieved with a unique, curved, tripartite case design using torque screws that can be individually and precisely tensioned with high accuracy around the exterior circumference of the case. This is complemented by a screwed crown construction. The lugs of all versions are in titanium, with screws to attach the rubber diving strap for maximum security. Built up of three layers connected with 22 screws, turning unidirectionally following ISO 6425 norms to avoid timing miscalculations. 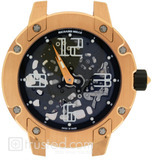 The use of an additional screwed system attaching the bezel to the watchcase makes it absolutely stable as well as impossible to inadvertently dislocate or loosen. In addition, the use of screws allow for perfect adjustment since the bezel is not tensioned into position. For clearer visibility under murky conditions, starting at 12 o’clock, the five-minute markers of the first quarter are highlighted red.